In September of 2016, the Civics Education Committee of the Utah State Bar is holding its fifth annual Constitution Day Celebration. This year is the 229th anniversary of the Constitution. It is also the 50th anniversary of Miranda v. Arizona and the Miranda warnings, the notification of rights from the Constitution, http://lawday.utahbar.org. Please join the hundreds of judges and lawyers who will meet with social studies classrooms across the state and teach students about the separation of powers and the importance of an independent judiciary. The committee has developed an inventive curriculum and has prepared engaging materials. It’s very simple: Attend a CLE or view a video, print the handouts, and then give students a hands-on opportunity to learn about the Constitution. In 2011, the American Bar Association co-authored a report on the civic mission of schools which noted that a recent Annenberg Institute for Civics survey about the Constitution indicated that only 38% of Americans could name all three branches of our government; 33% couldn’t name any branch. Recognizing that an educated citizenry is critical to good government and seeing an opportunity to help in our community schools, the Bar Commission created the Civics Education Committee to develop and promote a one-hour course to be taught in Utah schools. The course focuses on the role of the three branches of government and the importance of an independent judiciary. The Utah State Bar, through its Civics Committee, has created a one-hour lesson plan on the United States Constitution, emphasizing such foundational tenets as separation of powers, rule of law and the importance of an independent judiciary. In 2005 Congress designated September 17 as a day "to hold educational programs for students" on the Constitution, and every year since 2011, hundreds of judges and attorneys have taught school children throughout Utah on Constitution Day. We encourage you to participate in this program. For the survey on American awareness of the Constitution: http://www.annenbergpublicpolicycenter.org/new-annenberg-survey-asks-how-well-do-americans-understand-the-constitution/. For the report on the Civic Mission of Schools: http://civicmission.s3.amazonaws.com/118/f0/5/171/1/Guardian-of-Democracy-report.pdf. 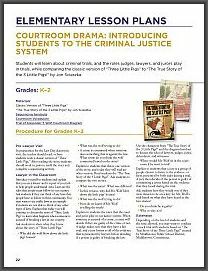 Elementary, Middle School, and High School lesson plans based on the Miranda warnings and Miranda v. Arizona (this year’s Law Day theme) can be found HERE (PDF). See more on Miranda HERE.